Students will learn an easy-to-do, non-traditional method to make and finish off a knotted pearl necklace using silk cord. This non-traditional method does not require the use of tools. Topics covered: pros and cons of traditional vs. nontraditional pearl knotting techniques; how to buy and care for pearls; pearl knotting techniques; how to finish off a pearl knotted necklace using french wire bullion and using bead tips; how to make a continuous pearl knotted necklace (thus, without a clasp); how to add cord to your piece, so that you can make a longer necklace. This is a beginning, introductory class. 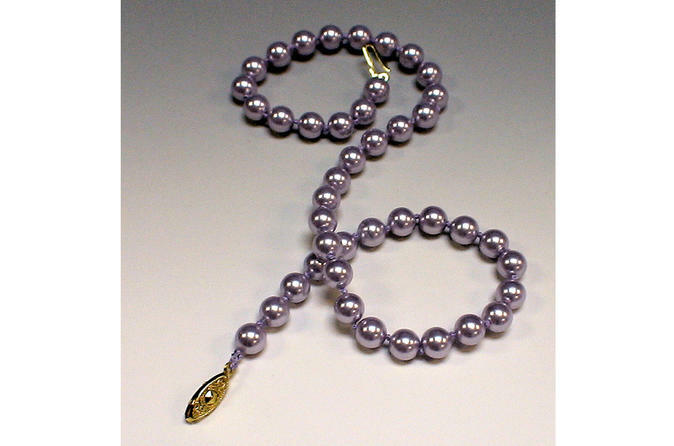 To teach how to hand-knot between beads using an anyone-can-do-it method which does not require the use of special tools. SUPPLIES REQUIRED: Can be purchased prior to start of class, or bring your own. Cost apprx $20.